It’s day three of my involuntary, lurgy-related incarceration. As you can imagine, I am not coping with it well. Yesterday, having taken until midday to generate sufficient energy to get myself showered and ‘ready’, I decided I should venture outside to check the greenhouse before the rain set in again. It was not a brilliant idea. I was freezing within 5 minutes, which was not long enough to complete the tasks I’d set myself and left me feeling rather downcast. Comfortably back indoors, looking forward to lunch (happily my appetite is unimpared, a good sign surely?) I had in front of me a jug of small, very ordinary daffodils. They clashed horribly with all the furnishings in the library, but studying them gave me greater pleasure than anything else in the room. Commercial cut flowers are such a different race from those we grow in the garden. It does not matter what’s going on below the waist, so long as their elongated upper portions are crowned with a bounty of bright, long-lasting blooms. Gerberas are a case in point. Their particular needs – steady warmth, good drainage and abundant ventilation – make them quite needy house or greenhouse plants. Most of us encounter them only as cut flowers, parted from their unspectacular foliage, with their naked, fuzzy stems terminated by daisies of improbable, almost artificial perfection. Since Volkswagen decided to plonk plastic gerberas in test tubes on the dashboard of their new Beetle in the 1990s, the Transvaal daisy, as it’s otherwise known, has been languishing somewhere between naff and passé in the flower fashion stakes. Despite that, gerberas remain the fifth most popular cut flower in the world, after tulips, carnations, chryanthemums and roses. 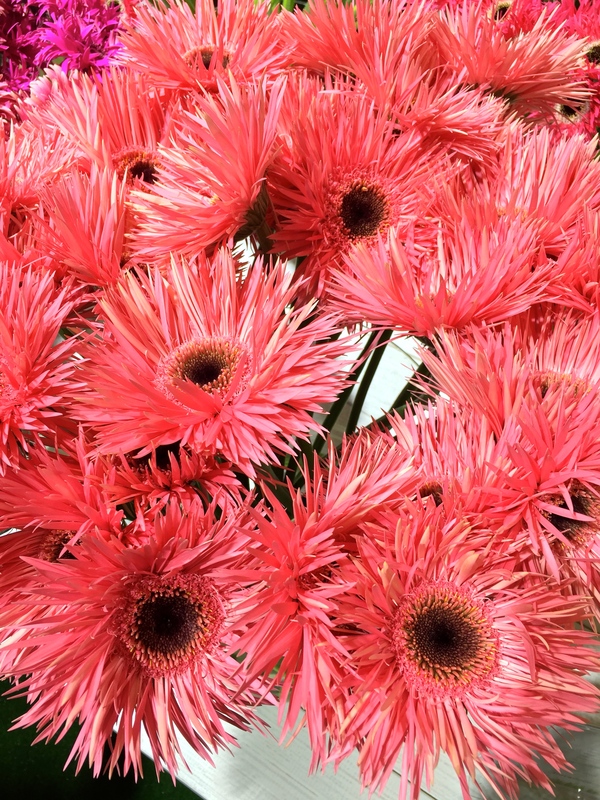 Those cultivated as cut flowers are the result of a cross between Gerbera jamesonii and Gerbera viridiflora, both plants from South Africa. They arrived in the UK in 1887 but proved better suited to commercial cultivation on the French Riviera and, latterly, under glass in The Netherlands. Whilst our heads have been turned by hydrangeas, gladioli, dahlias and peonies, the Dutch have been busy ‘improving’ the gerbera, with some eye-catching results. 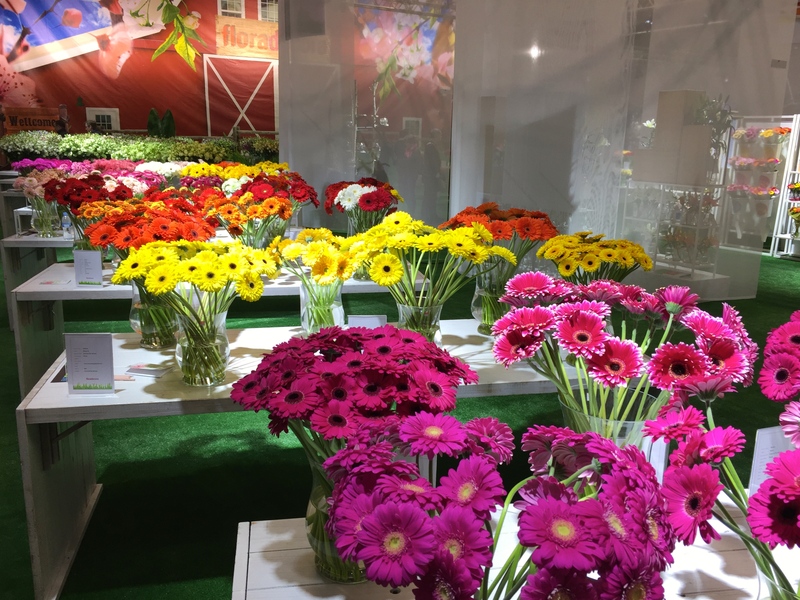 Last week at Floradecora in Frankfurt, growers from The Netherlands mounted spectacular displays of the newest cut flower varieties, including roses, lilies, tulips, bouvardia, lisianthus and, of course, gerberas. I was most taken by the more free-form gerbera introductions, such as ‘Pasta Rosata’ (below) and finely fringed ‘Pink Springs’ (bottom of post), perhaps because these looked least like conventional gerberas. Closer inspection of individual blooms revealed incredible complexity, variation and subtlety of colour, possible only because each gerbera ‘flower’ is actually composed of hundreds of smaller florets which can be manipulated by the breeder to create endless variety of size, form and shade. 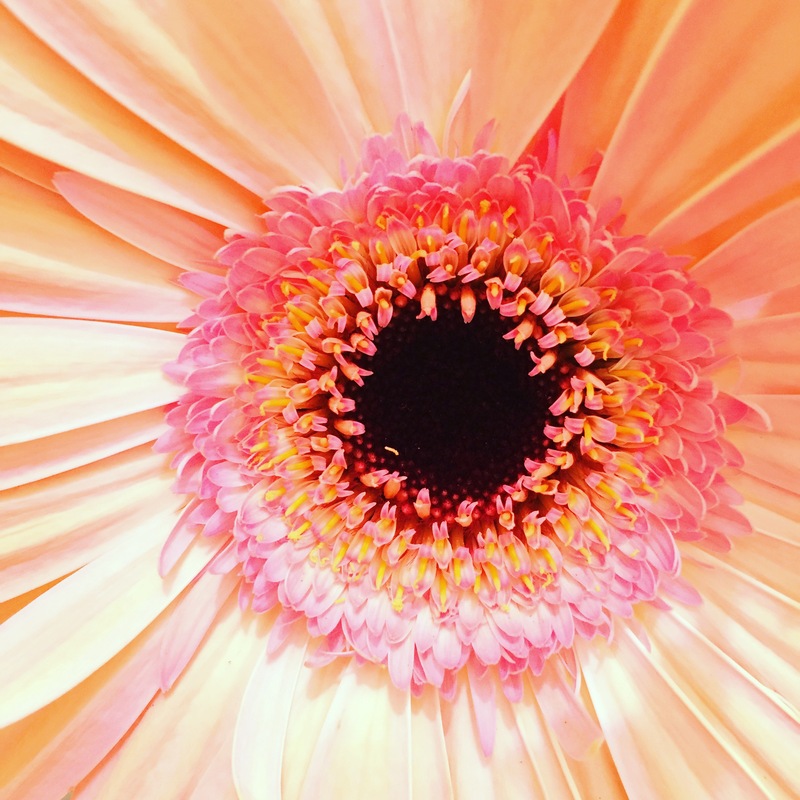 The gerbera’s colour spectrum starts with white, moving into yellow, orange, red and pink, ending with magenta and deep, velvety red. There are simple single blooms alongside dense doubles and ‘specialities’ with pincushion centres surrounded by longer ray florets. 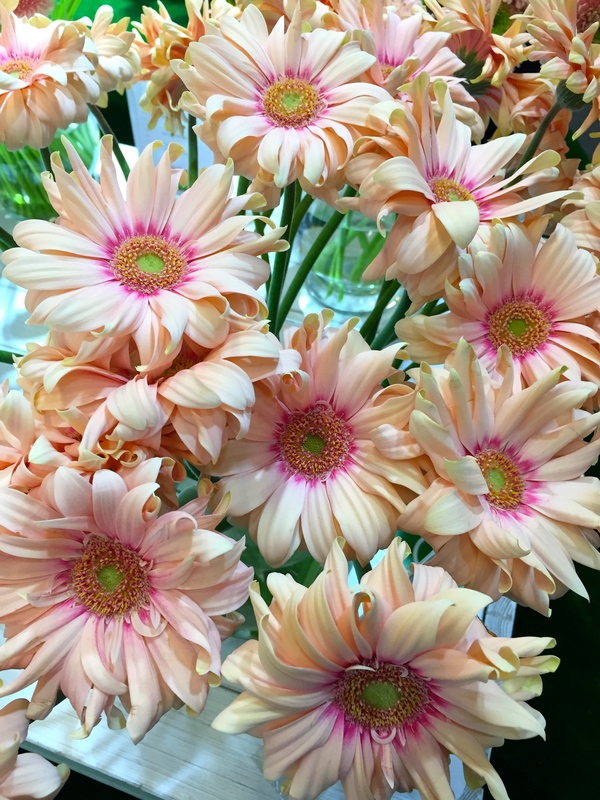 Improvements in breeding, cultivation and treatment before the blooms reach the end consumer mean that gerberas now last longer, look better and stay more upright in the vase than they did 10 years ago. 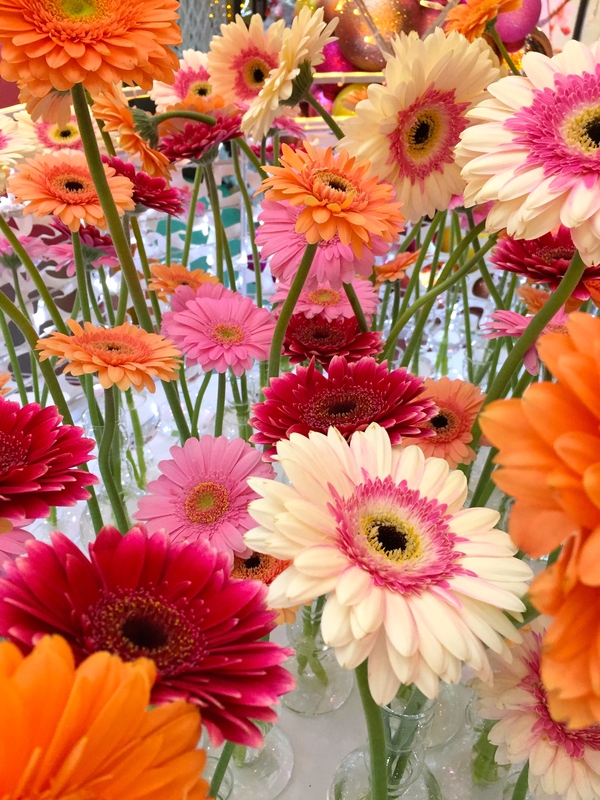 Popular flowers like gerberas, dahlias, chyrsanthemums and roses must constantly evolve and reinvent their image if they are going to remain at the top of their commercial game. By introducing a softer colour palette and looser shapes, gerbera breeders are responding the same trend that brought dahlias such as ‘Labyrinth’ and ‘Café au Lait’ to the fore. Having spent a few happy moments browsing the displays, I was once again won over by the cheer-leading vivacity of these champion cut flowers. Am I persuaded to attempt growing gerberas at home? No, thank you, but next time I stray into a florists I shall certainly cast my disapproving glances elsewhere. Love them or loath them? Either way, I’d love to hear your thoughts about gerberas. You are probably right. I must say, I love a carnation, but only when it’s heavily scented, unlike the bland offerings found in supermarkets. I have a fond memory of them as my bridal bouquet was that of gerberas, all those 45 years ago… and for womanwalking it is hard G pronouced as in girl (G) from a German botanist Gerber. The same as we say clivia with I not E from Mrs Clive :). That’s a lovely memory to have Barbara. Were they white? Thanks for the pronunciation tips. I am guilty of getting both wrong in that case. I shall correct myself forthwith! Gerberas always go droopy whenever I have had them as a cut flower and then the stems go all black so I always pick something else more bomb proof from the florist! Get well soon Dan…spring is coming…honest! 💐PS just re read my comment and auto correct had turned ” gerberas” into “Herbert’s”!!! Herberts sounds like a old English common name for something rampant ….. E.g. ” Help, my garden is overrun with Herberts” 🤓. According to the leaflets I picked up gerbera stems are now treated with a bactericide before packing to avoid the blackening you mention. The growers also recommend adding a little chlorine to the water in the vase. However, I agree, they seem to be better supported by sturdier stems. I sure I have some weed in the garden I could re christen Herbert,! Dearest Dan – goodness you must be feeling so poorly to be left languishing on the couch. “happy’ flowers we call them here – not the ‘nicest’ tone when ‘happy’ is mentioned. Like most things it depends on the species. I planted about 30 Gerbera Garvinea – Catherine last year. a minature spidery white flower that is just so pretty and the vivid green foliage is gorgeous especially when mixed in some black mondo grass. They don’t really love the 35 plus heat as I used them as a sort of border which wasn’t the smartest decision I have made. I am planning to move a few in autumn to under some Japanese maples where they will get a little more protection. I have found I have had to deadhead quite regularly which is a bit of a pain but worth the effort for the overall effect. I would even consider planting these just for the foliage. A lovely post and most informative, thanks TFG. Also enjoyed your daffodil post yesterday but didn’t get a chance to respond. It is a true joy to see the floats in our paddocks in spring, and I will never ever forget a taxi drive up the mall in London heading towards Buckingham P a few years ago with the thousands of daffodils either side. It was just glorious. I have never been that fond of gerberas. Too big blooms, too artificial looking. Until I got a potted plant of yellow gerbera from my mother-in-law. They looked much more natural, with slightly smaller blooms than the shop, cut-flower varieties. And they kept coming up with fresh, yellow blooms all year. Sadly, the plant lasted only one season and never came back the second year. I had it out in the garden for the summer and it didn’t survive winter indoors (I have no means to store plants cool indoors over winter). I think it’s best to adopt the philosophy that house plants are not for life. I am terribly guilty of hanging on to any and every plant in the belief that I can coax it back into the condition in which it left the nursery. (I have a dozen weary orchids and streptocarpus to prove it.) That’s rarely going to happen, so best to start again and not feel a failure for ‘letting go’. I’m fond of cut flowers that are ‘stately’ and so I quite like gerberas’ neatness and almost artificial form, and the fact that they have such tidy stems (until they go over and flop dramatically). Tulips are my absolute favourite, though; I do not like carnations or chrysanths. One bit. Hope you’re on the mend. I am, thank you Sam. I’m down to just a cough now. I am coming back around to chrysanths. I actually quite like the smell of them. Tulips I like in the garden better than as a cut flower. Cut tulips always look a bit insipid after a day or two. I should probably buy more expensive ones and see if they look a bit healthier! I was, until I came back to work!! My voice has almost gone after a solid day of meetings 😶. Some might say that’s a blessing! I’m with womanwalking: like sunflowers or daisies, the single ones look exactly like the flower a child would draw – cheerful. And the kaleidoscope of colours they come in (especially the vibrant shades) should be even more to a child’s liking: anything but true blue or black and in a multitude of combinations (green eye, yellow eye, dark-brown eye, no eye…). I have a special affinity for cut flower gerberas: half-a-life ago they were one of the main “crops” in the 5 hectares under glass where I did my apprenticeship. I remember many days of watering them with a hose – they were planted out in raised beds – where I could daydream for hours with no-one else in sight. We were always reminded of not splashing the leaves if possible, as they were so susceptible to fungus infection (though fungicides were used). I do not like gerbera foliage – classic case of rabbit fodder-look, hence wouldn’t ever go for potted ones – but the tall stems and those large blooms of the cut-flower varieties were awesome. I particularly remember some neon-pink/ magenta flowers with dark-brown eyes which took my breath away as I’d never seen anything like that before: where I grew up, you’d only ever find muted, bland colours with no “eye” in flower shops (if at all). You are welcome Stefanie! Thanks for reading up about the library. Lots more to do there so it won’t be last you hear of it. I loved hearing about your relationship with gerberas, which is certainly more intimate than mine. Your dad must have been blown away by the brightly coloured bouquet. I hope he had a vase big enough to display them? The range of colours available now is dazzling, so much so that growers produce colour cards, like paint charts, to illustrate the spectrum. Well, I certainly didn’t know that last bit with the colour charts. Looking forward to reading more about reading :-). Have a great day! Love, love, love those gerberas. Enjoyed your blog post, too. I love Gerbera! Its true I love anything that grows in this wretched climate and yes these have been an absolute revelation. I also thought they were rather picky to grow, water on the leaves and rotting etc but much to my astonishment they’ve proven quite the opposite. Im not sure if it’s because of chance hybridising of specific species but they have proven to be astonishingly tough things. So tough they’re almost impossible to kill. Full sun in the 30’s %C with 70+ humidity flattens them completely and I mean completely. Think those old rocket leaves forgotten in the bottom of your fridge. However by nightfall they’re back to their perky normal selves. Three weeks of solid monsoon down pour with 34%C and 100% humidity and they look astonishingly lovely like a salad green a picky tortoise would aim for. So I plant them in the semi shade (away from the tortoises) where they do their thing. Forgotten looking like a weedy dandelion where they’re always surprising me with incredibly bright lively colour in Autumn and early Spring, the dryish but not completely dry slightly cooler months. The more wet and heat they get in the growing season the better it seems. The clumps spread quite nicely too. Yet also quite happy through a completely dry warmish winter where they rapidly return from the root stock when the rainy season arrives. They Dont completely vanish when dormant but the leaves get smaller and smaller until it’s just a tiny tuft. Im honestly quite amazed. I dug a few up and notice they get long, very deep, strong strap like roots that grip and reach down far into the mud. What seems to be the case is that they dont particularly like cool and wet at any time….but hot and deluge and they’re loving it even in the tropics. Plants are strange things though, because kniphofia will drop dead after even ten minutes in such conditions, I’ve tried a few times. Anything with predominately Cape in its blood from Southern Africa is a disaster for me.